I love Reese's cups. And better yet, I love frozen Reese's cups. There is something about that cold creamy peanut butter center and perfectly hardened milk chocolate that makes heart sing at every single bite. As I was cleaning out our freezer the other day, I came across one lonely Reese's cup, hidden in the side door. I couldn't help but think, yes of course that looks incredible, but I know I can make something just as delish + super healthy. I made the decision to stay away from refined and processed sugars for the main reason that they just don't benefit my body at all. Not only do I feel awful after eating sweets (headache, stomach cramps, yuck) but refined sugars literally don't have a single beneficial nutrient in them. 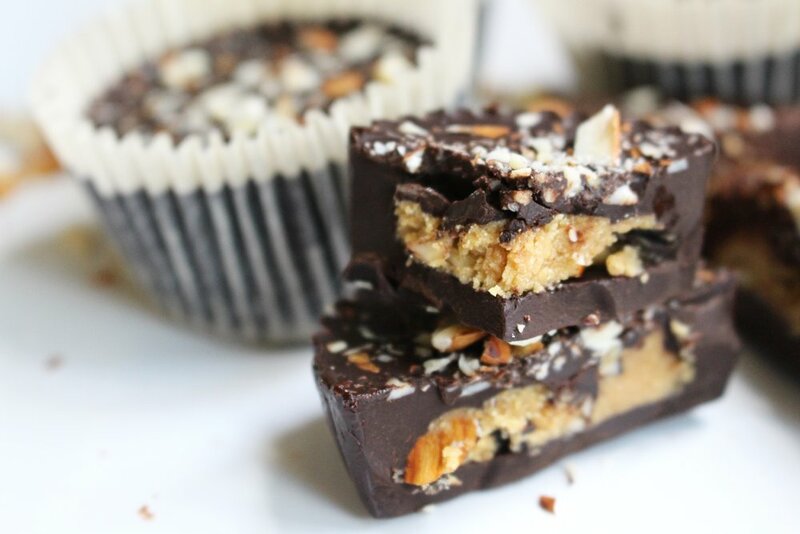 With that, these dark chocolate peanut butter cups are refined sugar free and naturally sweetened with honey! I also love Reese's for the fact that they do a have a few grams of protein, despite the fact that they're still a candy bar. And because I love sneaking in protein in every healthy dessert, I definitely wanted a protein packed filling! This creamy, peanut butter mixture is so delicious that I saved the scraps so I can just eat it later #yaaas. 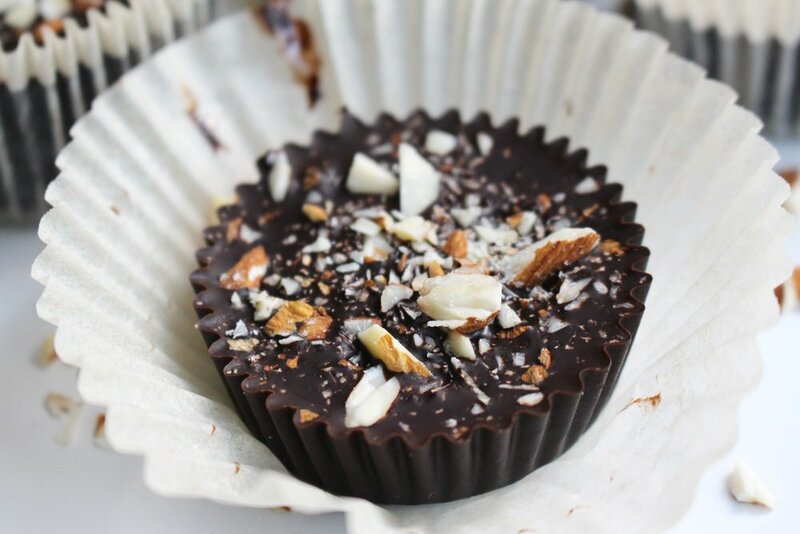 Between the super dark chocolate and this sweet filling, these protein cups are to die for! I hope you love it as much as we do! Begin by breaking up one of the two chocolate bars into medium sized chunks. Carefully melt the chocolate until it is smooth and lump-less. 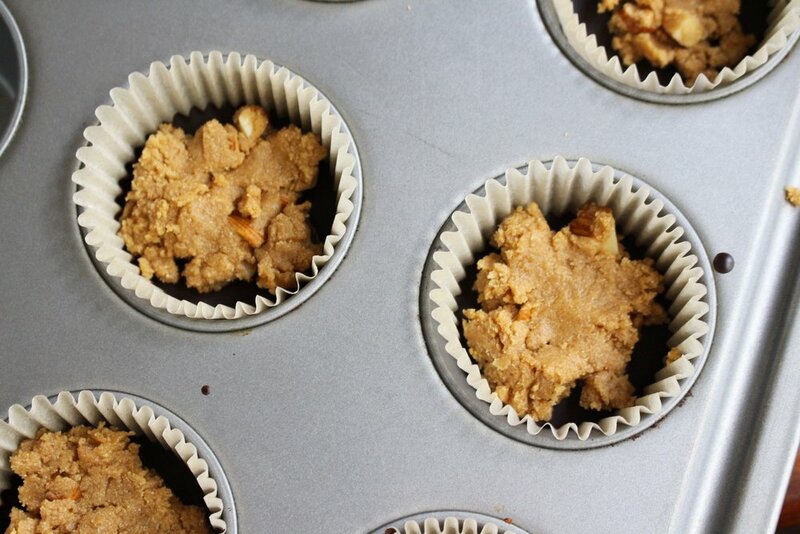 Pour the melted chocolate into parchment cupcake liners until the bottom of the liner is no longer visible. I used roughly 2 tablespoons of chocolate for the bottom layer. Let cool in the refrigerator until completely hardened. In a small mixing bowl, combine your peanut butter (or nut butter of choice) and honey. If needed, microwave for 15-20 seconds for a smoother texture. Add in chopped almonds and protein powder, stir until a dough like texture forms. Carefully place a dollop of the peanut butter protein mixture onto of your cooled base chocolate layer. Next, repeat the melting process for the second chocolate bar and pour over the peanut butter shell center. Let cool for in the refrigerator for at least 30 minutes, or in the freezer for about 15. Once cooled - enjoy! *Refrigeration in an airtight container is recommended!